My name is Maciej Sapiecha and I am a licensed massage therapist. I graduated from the Medikon Natural Therapy College in 1997. I am happy to welcome you to my website. Please feel free to browse through the tabs to find out more about massage therapy, the associated health benefits and how to prepare for the sessions. Massage therapy is a form of bodywork which is used in physical rehabilitation and biological renewal. I developed an interest in massage because it is a highly effective form of treatment that deploys various manipulative techniques and engages the sense of touch. Massage therapy promotes relaxation, and it improves the patient’s physical and emotional wellbeing. During years of professional practice, I discovered that for many clients, massage is not only about physical manipulation, but it is also a form of psychotherapy. Massage fosters an awareness of the body-mind connection, and it is one of the leading forms of holistic therapy. I am convinced that you will be able to experience all of the described benefits of massage during one of my sessions. 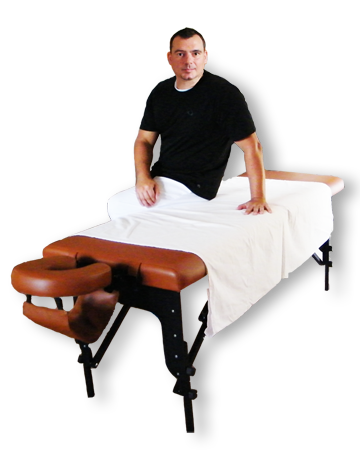 I travel with a comfortable professional massage table which I will set up in your home. I use baby oil, body lotion and professional massage creams during massage sessions. Clients are kindly asked to prepare a towel or a sheet for covering the table. If you get cold easily, please have a blanket ready (recommended for longer sessions).